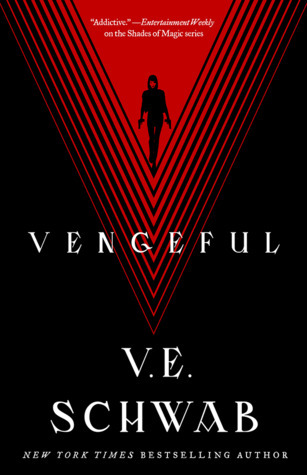 Vengeful had everything I liked about Vicious, Schwab’s dark superhero tale, and even improved in some ways upon the sequel. Before I get into this review, just a quick note that you really should read Vicious before Vengeful. This review will contain spoilers for the ending of Vicious, so read at your own risk. At the end of Vicious, Victor Vale died and was brought back to life by Sydney Clarke, who has the power of resurrection. Only, Victor hasn’t come back unscarred. His powers won’t work right, and he might die again — permanently, this time. Also, Eli hasn’t wholly been dealt with. He may be in prison, but he’s plotting his own escape. Victor and Eli may be focused on destroying each other, but outside events have unpredictable effects. A mob wife, Marcella Riggins, confronts a cheating husband and narrowly survives, waking up in the hospital with supernatural powers of her own. And she’s not content with lying low. What’s the point of power if you’re not going to use it? As with Vicious, the pacing is superb. I raced through Vengeful, finishing it in under a day. Schwab employs an alternating timeline that goes through Victor’s discovery of the problem with his powers, Marcella’s rise to power, Eli’s prison plotting, and Sydney’s steady practice of her powers with the end goal of bringing her sister back from the dead. Each chapter heading tells you where the section is in relation to a pivotal event later in the story, making you increasingly anxious to know just what we’re counting down to. My primary critique of Vicious was that it replicated many of the gender problems common with superhero stories, focusing on a battle between powerful men that leaves women either sidelined or at worst fridged. Initially, I was feeling the same way with Vengeful. Yes, Marcella might be powerful and Sydney might be coming into her own, but isn’t this really still the story of Victor and Eli? However, events later on in the book changed my mind, and I won’t give away any spoilers about it! Before Vengeful was released, Schwab said on Twitter that Vengeful would make Victor canonically asexual. This is true — there’s a brief section in Vengeful describing how he doesn’t feel sexual attraction, although the word is never used. The overall reaction from the community was mixed. Some people were thrilled, others worried that Victor was playing upon harmful stereotypes about asexual people — namely that we’re cold and don’t care about others. I was wary going into Vengeful, but ultimately I personally didn’t have a problem with how Victor was portrayed. Yes, Victor is cold. But he’s also not as cold as he tries to pretend he is. I mean, he’s basically adopted Syndey, and someone who’s really coldhearted wouldn’t adopt a kid and her dog or care so much about his best friend. All that said, this is just my perspective and I would understand if other asexual people felt differently. Overall, I found Vengeful to be a worthy sequel that in many ways improved upon the original story. I know it’ll probably be several years until we get the third book, but when that happens, I will certainly read it.